Wow... very intriguing observations, John! This was the first I'd heard of the Fleischers NOT calling the tune and naming their price when Paramount asked about Superman. 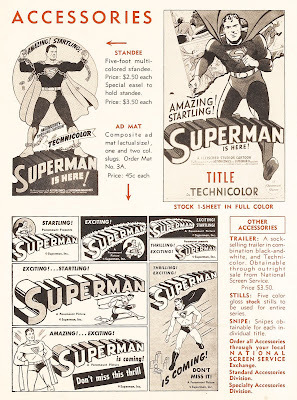 Correct me if I'm wrong -- I don't think the Superman cartoons were ever reissued. Unlike Warners, which reissued dozens and dozens of titles, Paramount never bothered much with reissues apart from Popeye. 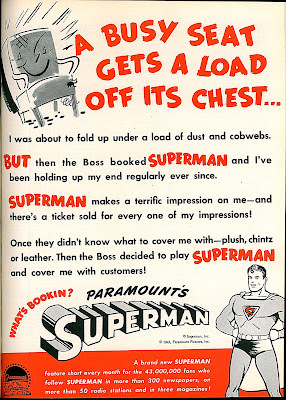 Maybe it was a licensing thing preventing subsequent runs for Superman, or maybe Paramount remembered those exhibitor complaints! John, your quotes from exhibitor comments reminds me of a brutal review of one of the early cartoons that I saw in Time magazine. It described Superman himself as a moron, if I recall correctly, and pretty much characterized the target audience the same way. In retrospect, it's remarkable how scandalous the superhero concept seemed to movie critics at the time. Thanks BookSteve, and I really liked your recent post about "To Be Or Not To Be." Samuel, I need to look up that TIME column. Sounds pretty rough. Guess I'm firmly in the moron camp myself for loving these cartoons as I do. Thanks once again for making this. I visit a lot of classic cinema blogs and pages and yours is the best by far. Great stuff, John! I went back to 1941 for exhibitor's comments, and found more enthusiasm than you did. I plucked a choice quote for my upcoming book (here comes the plug): "FLIGHTS OF FANTASY: The Unauthorized but True Story of Radio & TV's Adventures of Superman," due out in a few weeks from BearManor Media. 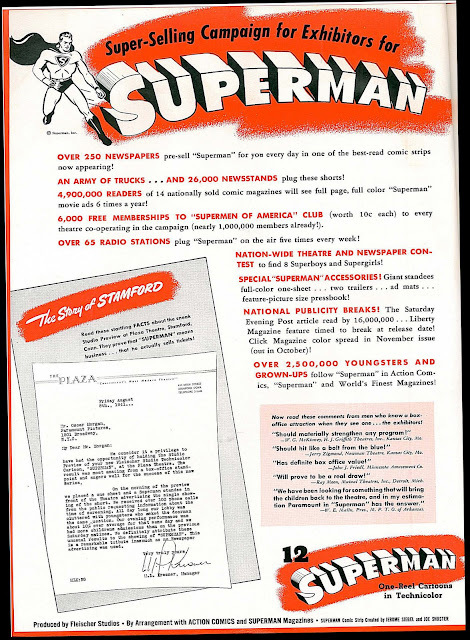 Surprised you didn't mention that National (which was then still just "DC Comics") almost consummated a deal with Republic for a serial in 1940 - same year the radio series made its debut. Republic even wrote a script, but the deal fell through in the fall when Paramount made its pitch. And I'm sure you know that Republic's "Superman" script was reworked into "Mysterious Doctor Satan" (not 1941's "Captain Marvel" as is widely assumed). I'm pretty sure the TIME article Samuel refers to is the one from which you quoted, their review of "Volcano." I was aware of the aborted Republic deal, Michael, but wanted to focus on the cartoons so the piece wouldn't run on too long. 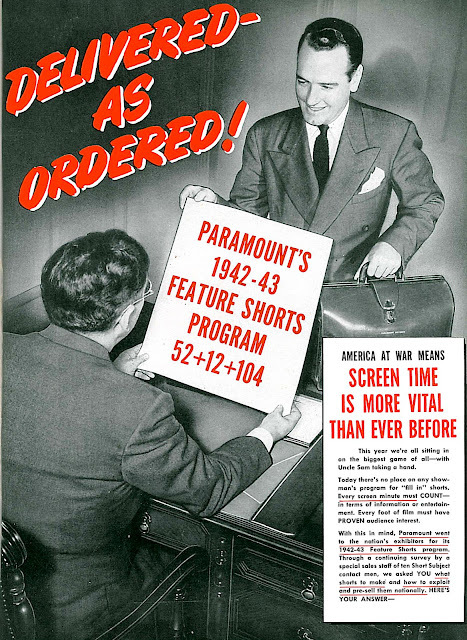 That serial/Republic/Paramount backstory might be worthy of its own post one day, however. Great post, though I think you are being a bit hard on Farciot Edouart's effects in No Time for Love, which looked pretty good to me when I saw it recently. 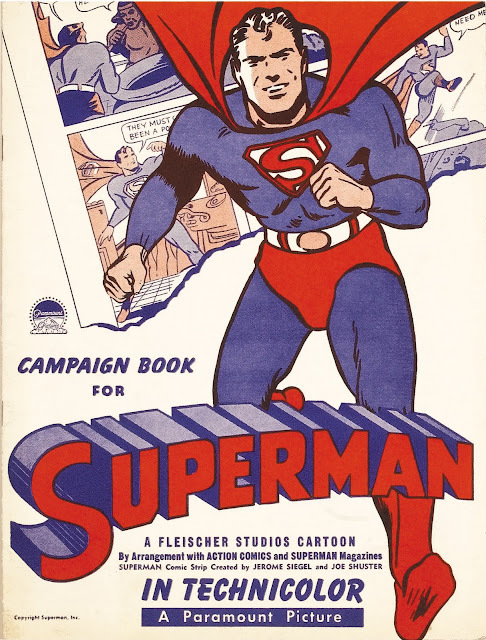 MacMurray, who is referred to as "Superman'' several times in the movie, was incidentally used as the model for Captain Marvel (who admittedly had better flying effects in his Republic serial, courtesy of the Lydecker Brothers). 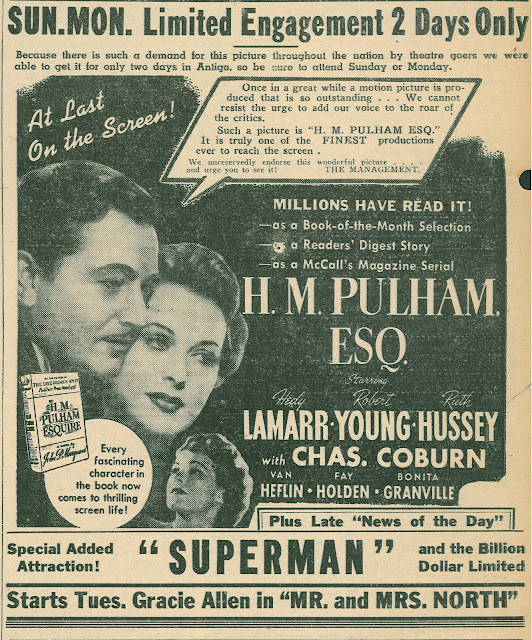 Paramount also reportedly contemplated a live-action Superman movie for Danny Kaye. Great piece! Wonderful clips and pictures, too! Not sure what audiences and exhibitors thought candidly, but I can assure you local theaters up in Northern Minnesota and Western Wisconsin plugged the hell out of the series all through its run. Researching old newspaper archives, I've seen huge ad slugs for the cartoons, something that was much more common for top mid thirties short subjects like Laurel and Hardy. I don't know from "Captain Marvel", but you can bet your booty that if I had been that age, standing in front of that theatre with my friend, which was currently displaying The Marx Bros. Go West, neither one of us would have been outside long! The notion of Bob Hope or Danny Kaye "Superman" movies reminds me of Philip Wylie's "Gladiator" becoming a vehicle for Joe E. Brown. IMO,the only golden era star that could have done justice to Superman/Clark Kent was Gene Kelly. Of course, it probably would have sunk his career. 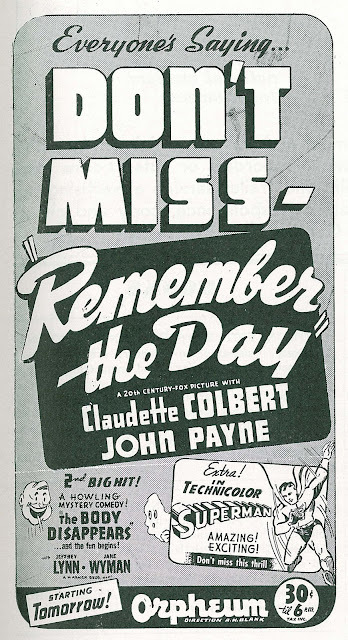 Ironically, Paramount had the perfect guy under contract in 1942 - then working in a film called "So Proudly We Hail" opposite Claudette Colbert, a film in which Superman is referenced. 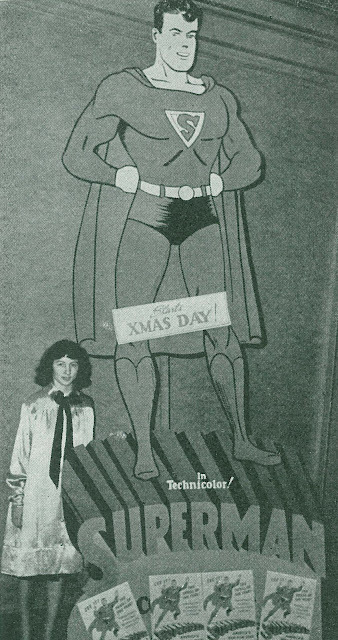 The studio also had the perfect Lois Lane showing up in their "Henry Aldrich" pictures. 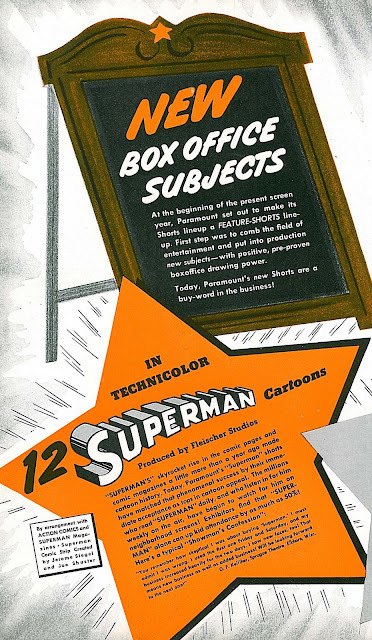 Unfortunately, it'd be another decade until George Reeves and Noel Neill made the Man of Steel magic. Thanks not only for this review (quite a bit I hadn't known previously), but also for the shout-out to the Superman OTR program. While certainly a product of its time, I've been quite enjoying it recently (I actually wrote a brief bit about that on my own blog just last week, in fact). Aesthetically marvelous piece!!! Thanks for sharing.